G.H. Schaapman to Mr. S.J. Hoogland. Ripon, California May 6 – 1936. It is quite a time ago that we wrote to you. When one starts to delay sometimes it becomes dangerous and however I think I don't have much news I'll try to compose a letter. We all are in a reasonable health and the other relatives too as far as we know. Ytje and her family came to visit us last week, last December they moved and live about 7 to 8 miles farther from here than before. Because of that we do not see them as often now. They changed their 40 acres farm for a 60 acres farm. That 60 acres farm was owned by the father of Ytje's husband, so they are more busy now. They have a lot of fruit trees there, I guess about 20 acres. Jaantje's husband has 80 acres and he and two of his brothers rent another 100 acres from their father. Those 100 acres he [the father] bought last year as an investment, if one has so much money as that man does, one sometimes don't know what to do with it. Financially Jaantje and Ytje married a better party than Geertje did. 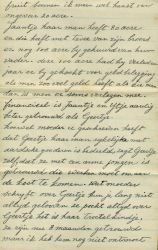 However mother wrote you that Geertje's husband has a lot of earthly goods, Geertje says that she married a poor guy who has to work for a living. 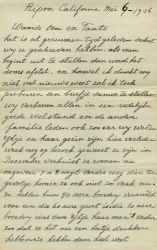 What mother writes about Geertje one cannot always believe. She always boasts on Geertje, she is her darling. They [Geertje and Dalton] are married 8 months ago but I didn't meet him yet, when I should pass him in the street I shouldn't know him. However people tell he is a nice guy. Geertje never visits her brothers and sisters. We visited Geertje some time after her marriage and gave her 5 dollars to buy a present and invited her to come over with her husband without any result till now. However they visit mother every two or three weeks and our houses are not farther away from each other than 60 feet, they don't come to see us. 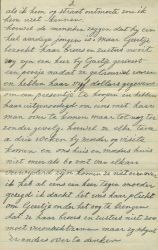 Once I said something about it to mother because I thought it was her duty to tell Geertje that she must not neglect her brothers and sisters this way, but it seems she has a different opinion about it. That Geertje is like this I see it as the result of the education mother gave her. 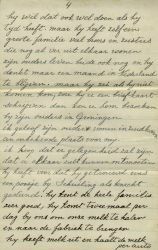 When father Schuiling was alive it also caused a lot of troubles between father and mother, the way she always favored Geertje above the other children. The others are diligent and saving. Geertje worked 8 years before she married and instead of having savings she had just debts. Jaantje's and Ytje's husbands are not visiting her [mother] when they visit us. Then Jaantje and Ytje visit mother but the men stay with us. They say that mother is too vicious and too suspicious. About Jaantje's husband she tells not much but she often makes derogatory remarks about Ytje's husband which is very sad for Ytje. But enough about this subject because I am quite sure that it is hard for you to believe this from Boukje however it is the full truth without any exaggeration. We have the first hay cut ready and are busy to plow the land to make it ready to plant beans. I think I'll plant about 5 hectares of them. Farming goes much better than it was during the last years, actually almost normal like it was before these bad years. Last months we get about 40 cents for the butter again while it was as low as 18 to 20 cents, which is twice as much. Last months we got about 190 dollars a month from 12 cows, so one can do a lot with that, the more because we have no debts and thus don't have to pay interest. At the moment we are busy buying an electric stove and an electric refrigerator and an automatic water heather. That fridge can become so cold that one can freeze in it. But they are very expensive, the one we want to buy cost 240 dollars, all three together will cost at least 400 dollars, a lot of money isn't it? That water heather is very handy, then we'll have hot water in the kitchen and in the bathroom and in the wash-house. Now we can run the water to the wash-house through pipes that saves the wife a lot of footsteps [he wrote]/walking to the stove. 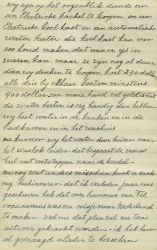 Now something else, maybe you can remember that I wrote last year that our neighbor van Til was planning to make a trip to the Netherlands. Well that plan will be realized now. I already asked him to visit you and he also is willing to do so when he has time. But he has a lot of relatives himself, many brothers and sisters who live far from each other, his parents are both still alive and he will stay in the Netherlands for just one month. 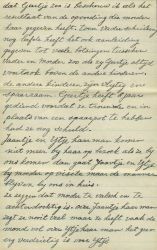 He said that if he was not able to visit you, he would send you a postcard, then you can visit him with his parents in Groningen. I believe his parents live in Zuidhorn, an unknown place for me. I hope that there will be an opportunity to meet each other. Before he married he worked with Schuiling for some time as a farm hand. He knows the whole family very well, twice a day he comes here to get the milk to bring it to the factory. He has a milk-route and picks the milk up by car. I don't know how far you people live from Zuidhorn, I believe that village is situated near Grijpskerk, you'll know. However I had geography at school in Holland, most of it I forgot except the bigger cities and the county towns. 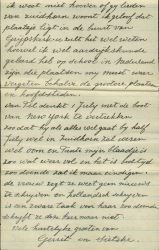 Van Til is planning to leave with the ship from New York, on July 1st. So if everything goes well he'll be in Zuidhorn mid July. Well Uncle and Aunt my sheet is almost full and it is bedtime, so I'll end. 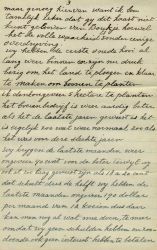 My wife says she has no news to write and to write Dutch is a hard job for her so she won't write this time. Hearty greetings from Gerrit and Sietske [also Sijtsche when she was a little girl].